An Abattoir of Flies is an expansion to the critical-acclaimed ‘Carcass’ roleplaying game. An Abbatoir of Flies provides new roles, campaign rules, new tribes, powers, and a mutltude of advice on how to handle the game. The expansion also expands on the roles, providing insight on how to use them differently, and new world building questions. 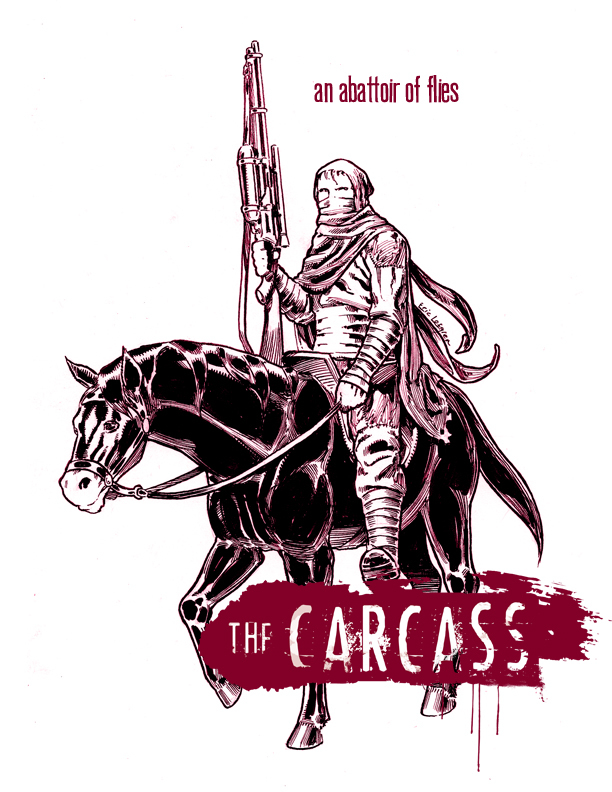 The Carcass is a roleplaying story game where players take on the roles of the last members of a dying post-apocalyptic tribe. The tribal leader is dead, the community in tatters, and the future a mystery. What will become of you in this barren wasteland? The Carcass is played over the course of three to eight hours (or more). Each player takes on the role of a character vital to the tribe. Devoid of a leader, however, each character believes himself or herself most capable of keeping the tribe alive. Players create two characters. One is a key figure in the community and the player’s main character. The other is an NPC member of the tribe of some influence. Beyond that, the tribe is made up of dozens of people who are just trying to survive. The game revolves around unique action charts for each character role, instead of a system of narrow ‘moves’ defining the character options. Often player expectations focus on ‘winning,’ especially with such important goals created through character design. But the interesting actions in The Carcass are not about winning, but about dramatic results. Once again, thanks for supporting post world games. We now you return you to your streaming of Mad Max 2.